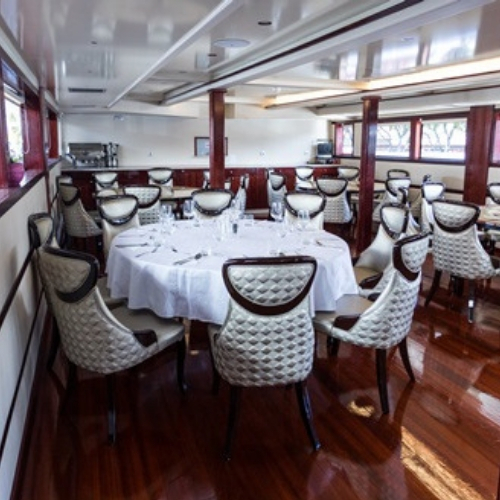 Completely refurbished in 2017, the deluxe MS Stella Maris was relaunched in 2018. The modern 49 m cruiser boasts state-of-the-art equipment and safety features, and spacious cabins and public areas. Arranged over the main and lower decks are 18 air-conditioned cabins with private en suite bathroom and the latest amenities. Comfortable communal zones include the elegant salon-restaurant, a lounge bar with large screen LCD TV and an extended al fresco seating area. There is also a large sun deck offering sun lounger relaxation and a shady canopy. At the rear of the ship, the swimming platform provides easy access to the sea. Relaunched in 2018, the 49 m MS Stella Maris is a modern vessel that offers state-of-the-art features and a high standard of safety. 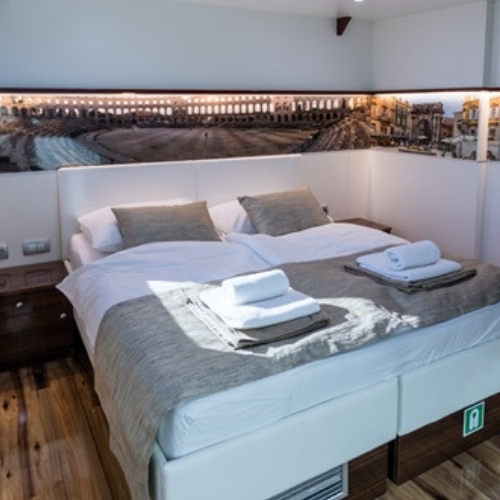 Refurbished to enhance sailing comfort, the ship boasts 18 spacious, air-conditioned en suite cabins that accommodate up to 36 guests. The public areas include a luxurious lounge bar with extended alfresco seating, and a chic salon-restaurant that seats all guests in a single sitting. There is also a swimming platform providing easy access to the sea during scheduled swim stops, and a large, partially shaded sun deck with relaxing sun loungers. Arranged over the main and lower decks, the 18 air-conditioned cabins boast a host of modern amenities and a private en suite bathroom with shower. Flat-screen TV, wardrobe, in-room safe and hairdryer are standard features. The airy and spacious, well-equipped interior boasts a modern design with a neutral palette of colours and elegant fabrics. The twin and double beds offer flexible bedding configurations to accommodate up to 36 guests. 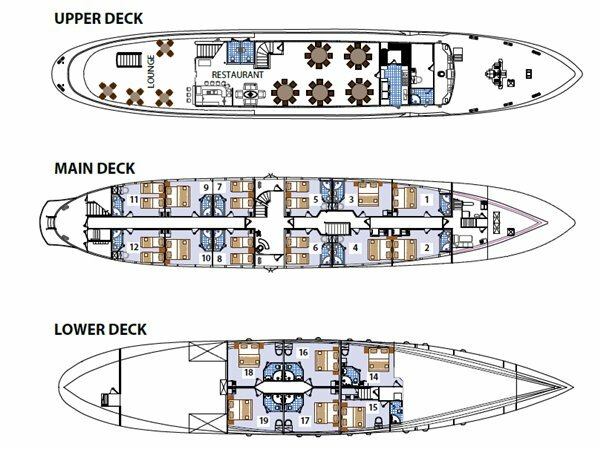 Main deck cabins have windows, and the lower deck cabins include portholes. 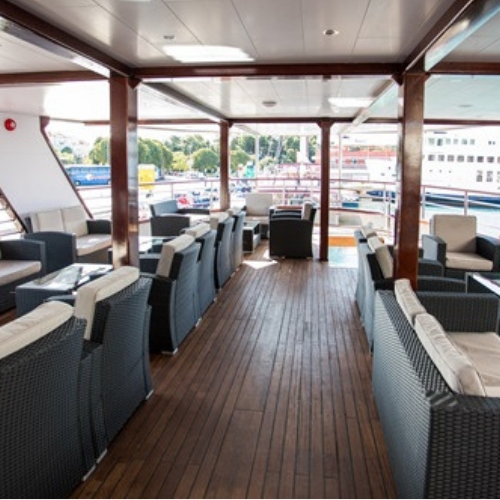 The public areas of the MS Stella Maris are designed to provide maximum relaxation and comfort. Guests can enjoy buffet breakfast or half-board dining in the elegant air-conditioned salon-restaurant that accommodates up to 36 diners in a single sitting. The views from the panoramic windows are spectacular. There is also a bar with large screen LCD TV and an al fresco area. 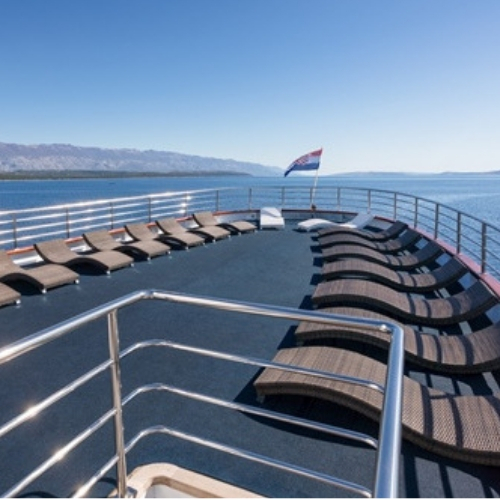 To soak up the sunshine, head for the comfortable sun loungers positioned on the large sun deck. A shady canopy offers an escape from the sun. At the stern, there is a swimming platform with ladder access to the turquoise waters.